Whenever I think of tomato tarts, I remember the first time I made them at my previous job as a catering chef. I was responsible for preparing lunch for a company of 50, which meant creating a menu to please all different palates. Fridays were slow days since most people liked to eat out. This also meant that we had to prepare smaller lunches to save money. 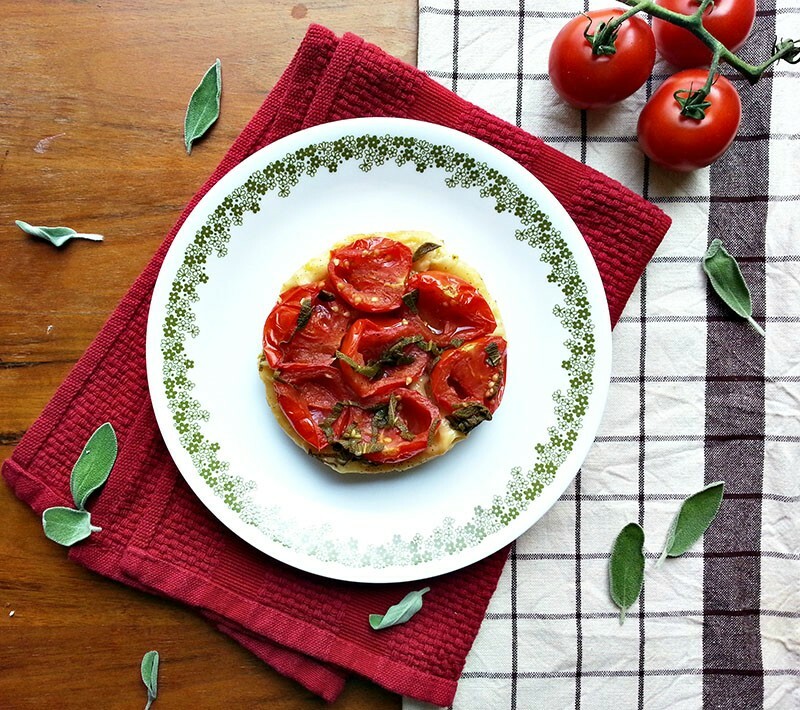 One Friday afternoon, my coworker and I decided to serve tomato tarts with a green salad on the side, light and delicious. Apparently, this meal was not enough as one employee disappointingly yelled, “Where the chicken at? ?” Mind you, she was also someone who didn’t know how to boil water, but we understood from then on that meat had to be a component on the menu. I haven’t had a tomato tart since that day but today was the day I brought it back. 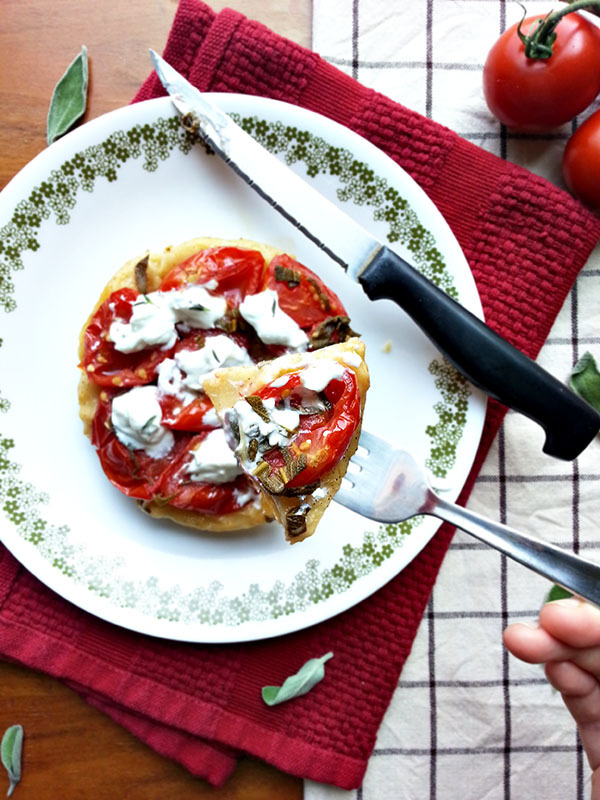 With an abundant amount of tomatoes available in the summer, it’s the perfect timing to prepare a Campari tomato tart with whipped goat cheese (and I enjoyed this with no chicken!). Prepare the whipped goat cheese. Place softened goat cheese with heavy cream in a medium bowl. Whip until light and airy. Stir in chopped fresh thyme. Set aside. Heat 1 tsp olive oil in a medium saute pan over medium-high heat. Add chopped sage and sherry vinegar and cook for 30 seconds. Remove from heat and pour into two 8 inch ramekins. Cut the tomatoes in half. Gently squeeze the juice from the tomatoes. Place cut side down in the ramekins. Cover the tomatoes with puff pastry. Bake the tarts in the oven for 15-18 minutes or until the puff pastry begins to rise and turn golden-brown. Remove from heat. Place a plate directly on top of the ramekin. Carefully invert the plate, letting the tart transfer onto the plate. Remove the ramekin. 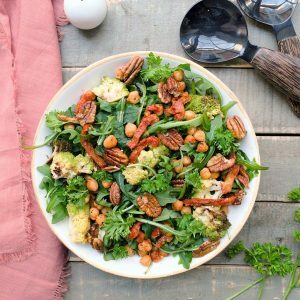 Top with whipped goat cheese. Serve. What is a Campari tomato? Campari tomatoes are a particular breed where the tomatoes are sweeter, a bit juicier, and incredibly flavorful. They are round and plump, larger than cherry tomatoes but smaller than regular tomatoes and are often sold on the vine. When I discovered this breed, I knew they would be perfect for a tomato tart. 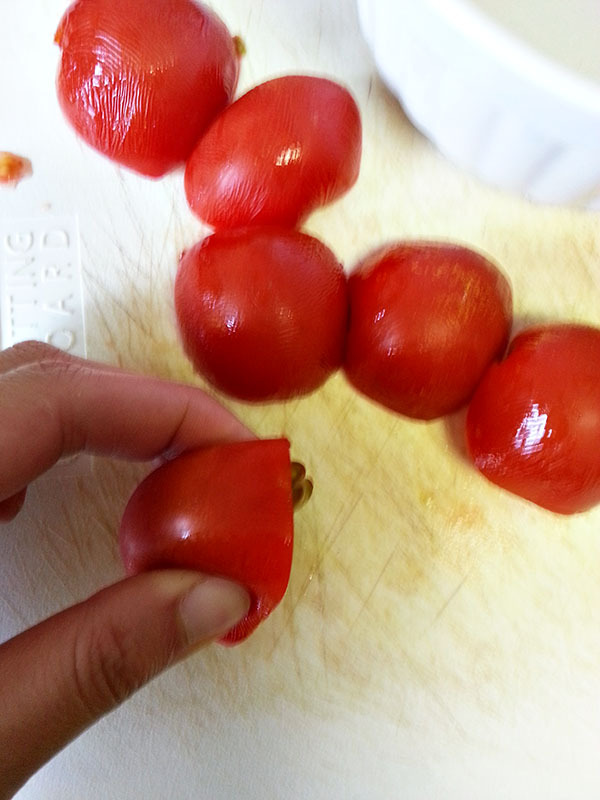 Because Campari tomatoes have more moisture than regular tomatoes, cut them in half and squeeze out the excess juice. This prevents the puff pastry from becoming soggy from the tomatoes. 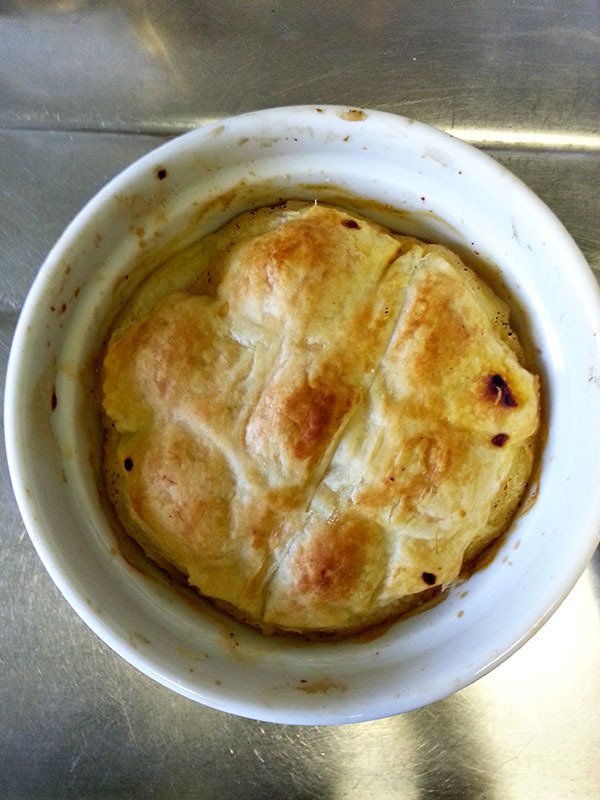 Trace the ramekin onto the puff pastry to have a perfectly sized cover. Cut and seal the ramekin. Bake until the puff pastry starts to puff and turn a lovely golden brown. Now here comes the tricky part of flipping the dish. Place a plate larger the ramekin on top and using gloves, flip both the ramekin and plate over. The tart should fall in one piece onto the plate in one beautiful motion. 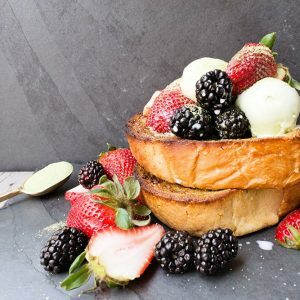 Sure you can enjoy the tart as is, but why not take it an extra step and top it with whipped goat cheese? The creamy cheese melts and becomes almost a sauce for the tart. 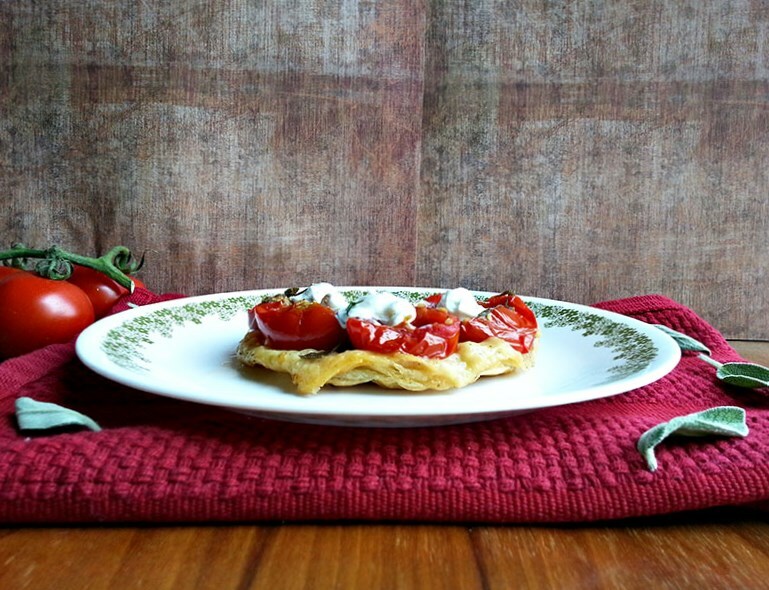 The sweet tomatoes transform boring puff pastry into a beautiful tart, showcasing its natural beauty. 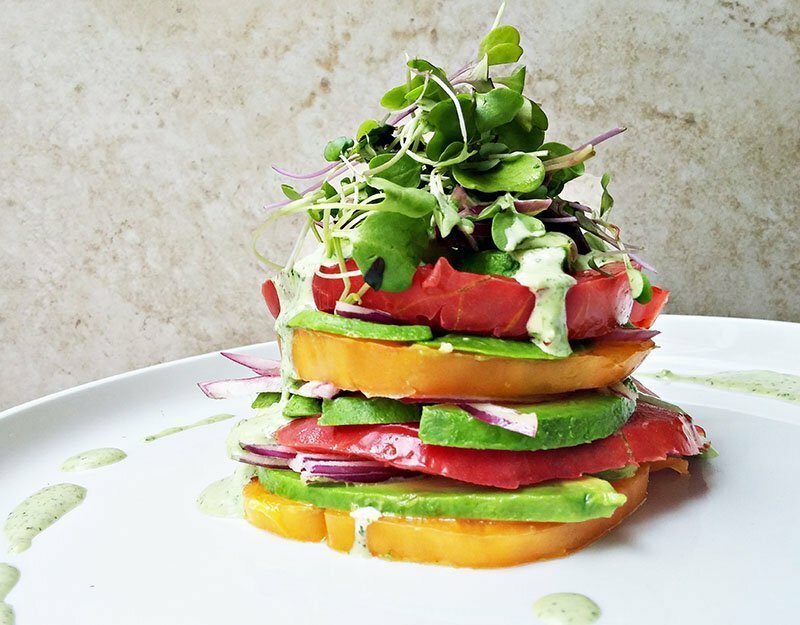 A great way to take advantage of tomato season! I love how elegant yet simple this is! In my opinion, goat cheese should be used in more tarts like these, it's so delicious! Completely agree - goat cheese is fantastic on tarts!